JenniferJoe just informed me that, if he read the newspaper correctly, it was actually the warmest April in Uppsala in 200 years. Nevertheless, I will stand by my post title. Here is a list of the celebratory things that happened, in reverse order, so as to save the best for last. 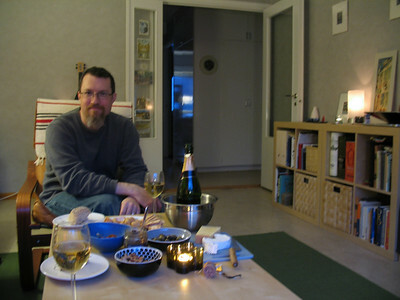 Valborg. 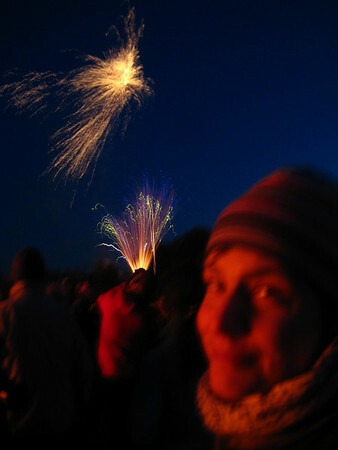 The traditional Walpurgis night here in Sweden, on which bonfires are lit to either welcome Spring or scare away the witches, depending on your view of it. We traveled out to the old Viking-era burial mounds where they have a huge fire, and fireworks, as we've done in years past. Our Swiss friends L. and J. drove, and brought a delicious hot soup with them, a traditional soup for the carnival season made mostly of flour and butter. The hot soup was very welcome, as it was nearly freezing temperatures, and therefore quite crowded around the fire. L. and J. had gone to the continent for Easter with family, so we didn't get to break cascarones over their heads as we've done in the last couple years. No worries—we got them at the fire. It's been probably more than a decade since I've surprised someone with a cascarone, and it was quite gratifying. Sista April. The day of Valborg is the last day of April, which is specially celebrated in university towns in Sweden—the day when the students or anyone who has anything to do with the University goes nuts. In previous years, we've been ambitious enough to make it to the student raft race, but this year, for the first time, it was webcast by the local newspaper, so we watched it with breakfast instead, which is much more relaxed. 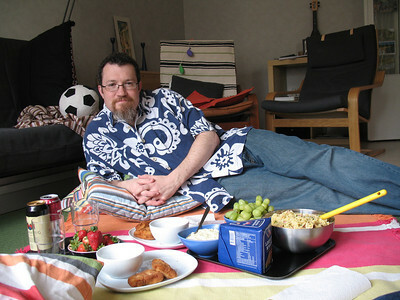 And having a picnic is also traditional, but this year the weather wasn't so nice—see Valborg, above—so we had our picnic on the floor of our living room. In some ways, skipping Sista April makes us seem more like real townies, but on the other hand it is fun to see the craziness, so I hope next year the weather is better. Easter. We missed celebrating St. Patrick's Day this last March, so we decided to both 'holidays' in one weekend and call it "St. Patrick's Resurrection Day (Observed)". 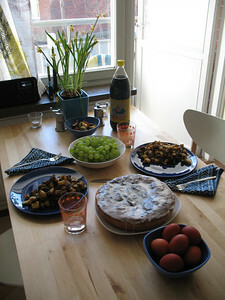 Saturday night we had a Guinness, and home-corned beef (you can't get it in the store here) and cabbage and potatoes, then we had Sunday brunch in which the beef was miraculously revived as hash, and there were Easter eggs and a home-made Danish coffee cake. Since the weather was quite nice we took a stroll over one of the large grassy areas by our house to do our traditional cascarones. 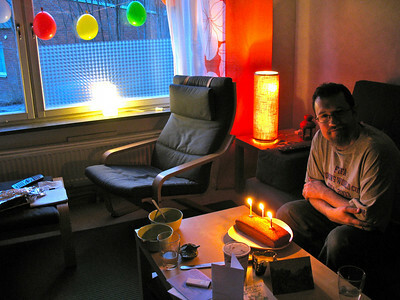 Joe's birthday was a few days before Easter, and right in the middle of a very busy time for him, but we had fun that night anyway, with balloons in the window, and pizza and ice cream and cake (home-made pound cake as per request) for dessert. I managed to convince Joe that he really should take the second pound cake in to work, which made him very popular with everyone and especially his advisor, so I'll count that as a win. Congratulations on the prize! Trondheim should be nicer at this time of the year than it was when we visited once at Christmas. One of the houses we stayed at was on a hill that the taxi couldn't climb, so we had to slide around with our luggage on the ice. It would have been lovely in the summer! The church in the center of town is interesting -- I hope you get a chance to see it.